Delhi gets its first Laundromat – A draw from the Western culture? Money-making has become a tough proposition in this highly-competitive world – where keeping competitors at bay on a constant basis is always a challenging task. Under such circumstances, it would be dreams come true if you’ve an innovative idea or service to offer, which is virtually non-existent in your nearby locality. One such unique concept, related to the western concept of community washing machines, is being reported to be making waves in Delhi. Yes, this concept of self-service laundry system – popularly known as Laundromats – is already existent in advanced western countries such as the UK, the US, Canada and Australia; and prominently used by hostellers, foreigners and even working housewives. The Delhi-based Laundromat at Satya Niketan is a walk-in laundry facility, where people pay and use a coin-operated washing machine to wash and dry (yeah! even drying clothes is a big headache during monsoons and winter season) a maximum of 6 kg clothes for an hour of spin-off. And, if you’ve hostels or college around the arena, it could be only a matter of time before you start gaining footfalls. For the uninitiated, Laundromats are commercial public laundries – usually coin-operated and self-service – that are made available to individual customers who are usually not equipped with a washing machine or dryers in their living space. However, some laundries do employ staff or a full service wash facility for the customers. 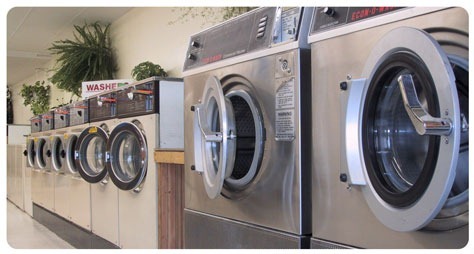 In fact, the business of Laundromats are so common is America, that some staffed enterprises also provide facilities like dry-cleaning pick-up and drop-off. Not only that, many housing societies have Laundromats within premises itself. Coming back to the Delhi facility, what comes as a little surprising to me is its high cost – Rs.150 for each round of wash-up. On simple calculations, I figured out that a family of 4 members could easily generate washables to the extent of 6 kg clothes or even more on daily basis. Does that warrant Rs. 150 for a machine-washed outsourcing service that my housemaid could do, for an extended period of 10 days, at the same cost? Oh! Yes, availing of such launderette service is just fine if your housemaid hasn’t turned up on a particular day due to illness. It could also be a blessing if you’re bachelor studying in a hostel wherein you accumulate clothes for whole week and get them sloshed over the weekend, all at once. Whether Self-service or staffed service? Finding a good location – a residential area – is the most important part in settling for a Laundromat business; preferably nearby some established paying-guest facility where people visit for a temporary stay and need to wash their Lenin once in a while. A good Laundromat should also be fully sanitized and have presence of at least an attendant (if not staffed serviced) during the hours of operations who will be responsible for cleaning the washers and tables, clearing-off the detergent residue and checking the results of wash-up. Most of the Laundromats are pretty crowded. An ideal setting would be the one with more washing machines at work which aim to provide a solitary experience. "Delhi gets its first Laundromat – A draw from the Western culture? ", 5 out of 5 based on 1 ratings. Indian Retailers offering Loyalty Programmes to woo consumers! Interesting Facebook Statistics & demographics! solution of Wash & Dry in 60 min.(6~15Kg). Pls provide me below Information. 1. Wash & Dry in 60 min. HI… I am very happy with this new Funda of washing clothes.It is very interesting and nice THING IN iNDIA…you please tell me the rates of each washing itemor / kg weight…Am living in Rohini Area ,you kindly tell me the nearest location pse..
1. For example, you could wash a gray shirt with either the lights or darks, or you could throw your bedding in with a small load of lights or darks (depending on the size and color of your sheets). Just never ever toss a new dark red or purple shirt in with the whites. I don’t think I need to tell you the results! In fact, you may want to wash it separately once or twice to make sure it won’t bleed. so how can we put all clothes in one machine directly…. I have tried both the Delhi service and back home in Hyderabad the LaundroPod service. The Laundromat offers low cost service, whenever I am in town and the Hyderabad offering is a full service option that offers convenience. Each has their own USP. For the entrepreneur, the laundromat option will require lower initial investment and possibly faster returns. I can deliver leased instruments to Organisations or individuals with their preferred text verbiage as been approved by their bankers. We also offer sales option to interested buyers. Our terms and procedures are so flexible and workable by RWA clients. Our lease rate is (5.5+0.5)%+x%. X% IS Lessee broker’s Commission and he determines his commission. Also we have facilities to discount BG and Put you into PPP Trading. skype: (besik.katsitadze) in other to furnish you with other information. i find it quite fascinating as i m a student living in north campus area….and i m interestd in seting up disbusines….bt m worried about how much wil a setup of 4 machines cost…. Hey im interested in opening up a laundromat in mumbai, but not sure whether people would really appreciate it out here because the dhobi system works so well out here. I have a couple of expat friends who would actually die for such a concept here but dont know abt the actual locals, any advice??? Very good concept nowdays for everyone. I operate a full service laundromat; pickup, delivery, washing & ironing; at Katraj in Pune. Loads of 8 kgs and more will be serviced at Rs. 25/- per kg while loads of 8 kg and less would cost Rs. 30/- per kg. Ironing would cost Rs. 5/- per piece which is charged in addition to the washing cost. We also offer Monthly plans also. Our USP is delivery within 24 hours of drop. Reach us at 9552058200 or [email protected] for more details. I am new to this forum, request you all to please provide any players from North india(delhi). as i can find some details from south india. i was doing my initial research on the subject, i am really surprised to see there are people who already working on this line. this will definitely work in India, currently there are few players in this sector. proper plan and proper selection of location will definitely give you huge success. As u mentioned that u were doing research on said field, can pls share ur results/experience ??? It will help many pls…..!!! from where can we buy the laundromat washing machines in india…?? We introduce ourselves as a leading laundromat consultants in southindia and looking forward to expand our business in north.We do have an varied range of laundry machines to serve customer needs. If you have an investment capacity of 5 to 12 lakhs and a minimum area of 600 sq.ft call us on 09600021986. I tried reaching you out but could not connect. I am looking forward to a venture in NCR region. Kindly reach out at +91 99-999-20278. I’m in Bangalore and would like to venture into this industry. What kind of ROI are we looking at ? Need a realistic figure. I would like to know more about the setup, could you please drop me a mail with all the details to setup the outlet. hi Robin, can you give me the contact no of ur laundry in chandigarh..
150 for 6Kg converts to 3$ for 13.22 Ib, comparable with US. Once wage and prices in India become same as US it won’t matter. The cheaper domestic washing machines are a smaller capacity, and the driers are usually spin dry. You need to to then let the clothes dry on a clothes line. guys,before you get all excited about the Laundry—let me tell you its a great thing and it is going to have agreat sucess rate.6kgs of cloth is plenty considering the light weight fabrics availaible these days–and India is a summer country—try weighing your clothes and you will be surprised.towels sheets and pillows are once a week wash only.So the laundraumats are going to be a huge success–the only reason this guy is charging 150 is probably because his rentals are killing him—and his total utilization so far must be about 35%.He will reduce his price to 50 when he is at 100% utilization–which will happen slowly but surely.Be sure of that.I know–I have a laundry in Chandigarh !!!!!!!!!!!!!!!!!!!!!!!!!!!!!!!!!!!!!!!!!! I need your contact number. i am interested in setting up alaundromat. Please reply as soon as possible on my mail ID. Can u provide me mobile number & address of this Laundromat . there is one in lazpat nagar..
Do this laundry in lajpat nagar provides pick up also. Pls provide me their no. I would like to highlight the difference in the concept of introduction of personal washing machines and laundromats in West and India. When first washing machines were invented, they were of the size to fill an entire room and very very expensive. So the inventors thought of how to introduce the new concept of mechanical washing (as against hand washing cloths till then). They logically arrived at teh fact that as an expensive machine, it can not be sold individually. So they thought of promoting it in a way that will not pinch the poscket of ordinary people. They installed about 20 machines in an appartment block of 100 or more tenents and installed a coin system. For the ordinary people it made commercial sence. No need to buy an expensive machine to have your cloths mechanically washed. By paying a token amount, they can wash their cloths. It is also a place of socializing in the basement of their own appartment building. Slowly due to technological advance ments, the machine evolved into one which can be easily bought by ordinary people. With the technology, Its size went down, cost of production came down so many people started buying their own personal washing machine. However the laundromat concept stayed in some pockets. Now coming to India, the machine was introduced after all technical advancements made buying your own machine was made viable. Now to me the logic of this laundromat feels illogical. Its the reverse of evolution. However from a business point of view, if we see the Indian scene, it makes scence. With the advent of IT industry, we all know that many graduates migrate to IT cities. In some locales majority of residents are single employees from other places. They spend 8-10 hrs in offices come home, do their chores. The most cumbersome thing to do at home no doubt is washing cloths (other than cooking). Most of them may be earning just enough and do not wish to invest in white goods. For people like them, the laundromat is most suitable. Instead of spending 20K upwards for a machine, they can spend 100-200 bucks for a load of washing. From environmental point of view too this concept is good. Consider a appartment block with 100 tenets. If there is no laundromat format, every tenet will buy his own washing machine. Now if u look carefully you run the machine for one hour at the most per day. The otehr 23 hours it is sleeping. Instead if you have a laundromat in basement with 20 machines, they can be better put to use. If you look at the nation as a whole, considering 25 crore families (for 100-120 crore people) we need 25 crore machines to wash indian cloths. Instead if we replace with laundromat format, India needs only 5 crore machines. The savings of 20 crore machines (each costing 20K) are 400 thousand crores. Also the investment needed to produce 25 crore machines ?? No I am not saying we should live in conditions similar to Russia in 60s where every aspect of living is from socialist view. But in between not having a laundromat and a above model, there is certainly place for the system. I strongly support such concept. More over it creates enterprenuers. In each block of a middle class community if u start a business of laundromat with 20 machines, it will cost about 5 lakhs. The daily returns (which each has to work out to make the venture profitable) will create livelyhood to the owner as well as a service guy there. I agree, tell me how it cost only 5 lakh rupees for 20 machines? Because What I got rates are more than 5 lakhs per set of dryer and washer. I will be interested if u have knowledge of less costly machines and intrested in buying the same. I’m all for the self-service landry model. It will be a huge successs in cities with high student clusters. The capital required for this business wouldn’t be too much. 6-9 lakhs. Why can’t we indeed have an apartment/society with laundry facility available. In that way, families who move in to a new city and move out in quick time need not carry their washers. Its a great idea. I wash 4 times a week and that means I spend 600 a month, going by what the Delhi Laundromat is charging. Is that too expensive? It depends on the circumstances. If they offer pick up and drop off, then I won’t mind it. Sorry 4 times a month. i meant. That’s what they say about every other innovation and just to disprove them, it worked!! In a city like Delhi, any new concept will have fans. And laundromats will definitely have a huge following as far as hostellers are concerned. I think there is one such laundromat in Mumbai as well…. run by IFB if I m not mistaken.. It will fail. Our good old dhobi does just that. You can not just open a US style laundromat in India. It has to be Indianised. Rs. 150/6 KG is overkill.Besides who in India will carry six KGs of clothes a laundry? An ideal service would be a pick up service that not only washes the clothes but also irons them and delivers home. A good old dhobi style, couple of such services are already running – iDhobi and LaundrEx. That’s more of Indian style. Self service washing machine facility will not work. I quite agree with you. India still haven’t got fully away from its Dhobi-laundry concept yet. And, the amount so charged by the Laundromat is comparatively expensive. But, again, its a relative aspect – the student’s community might still find the service valuable, even as it could prove to be of not much utility to the families.